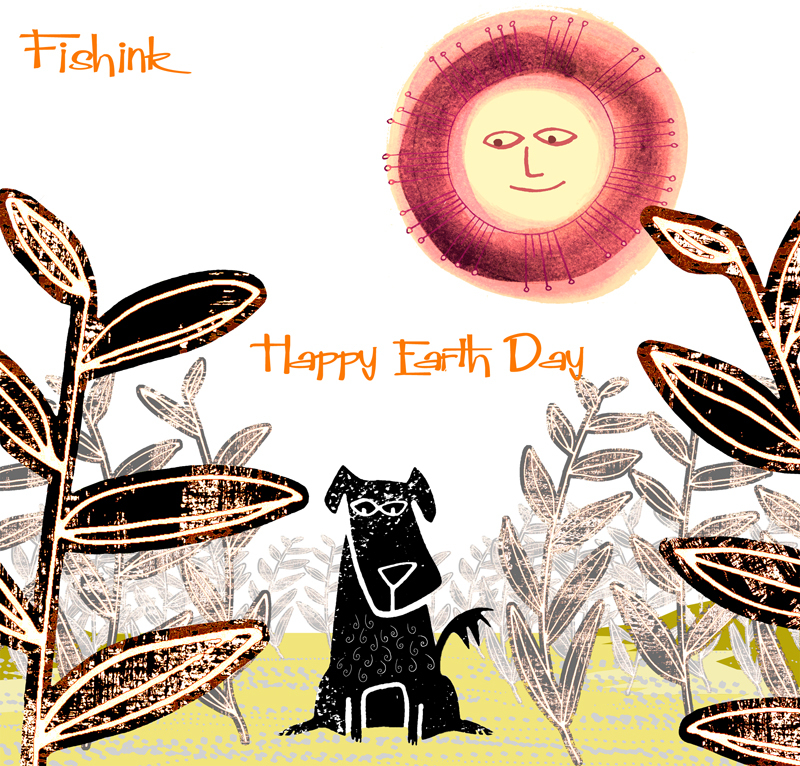 Hello to Monday everyone and I’d like to start by wishing you all a Happy Earth Day from over the weekend. Earth Day is an annual event, celebrated on April 22, on which day events worldwide are held to demonstrate support for environmental protection. It was first celebrated in 1970, and is now coordinated globally by the Earth Day Network and celebrated in more than 193 countries each year. You can read more here. … I’m hoping that’s the seal of approval now for this post lol. Like thousands of other children, I grew up with Ladybird books around me. I didn’t collect them, however, like many others I knew (and boy did kids like to collect things when I was growing up !) but I do remember going into ‘Bookland’ (my local book shop) and being confronted with a wall of Ladybird titles. It was quite literally (and visually) overwhelming ! So recently, I happened across a couple of cheap, possible first edition copies, of two familiar titles I remember owning as a child. 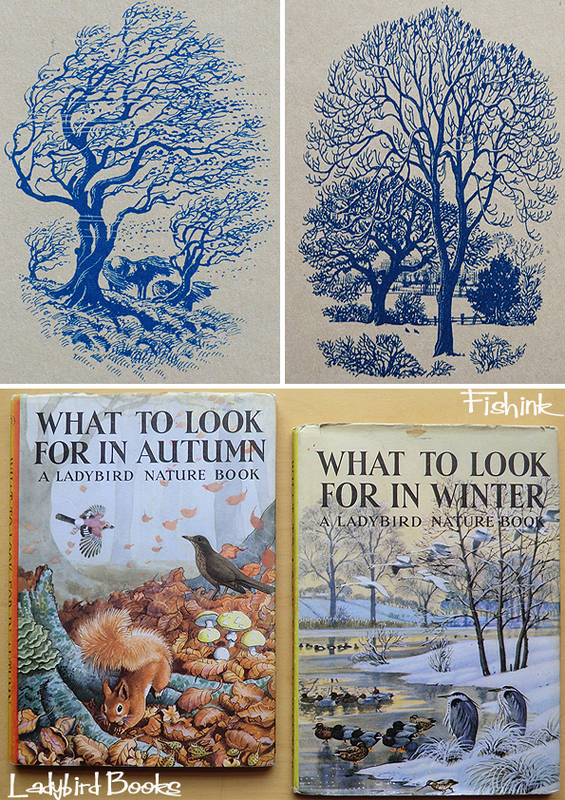 Part of the ‘What to look for in… (Autumn, Winter, Spring, Summer)’ series. 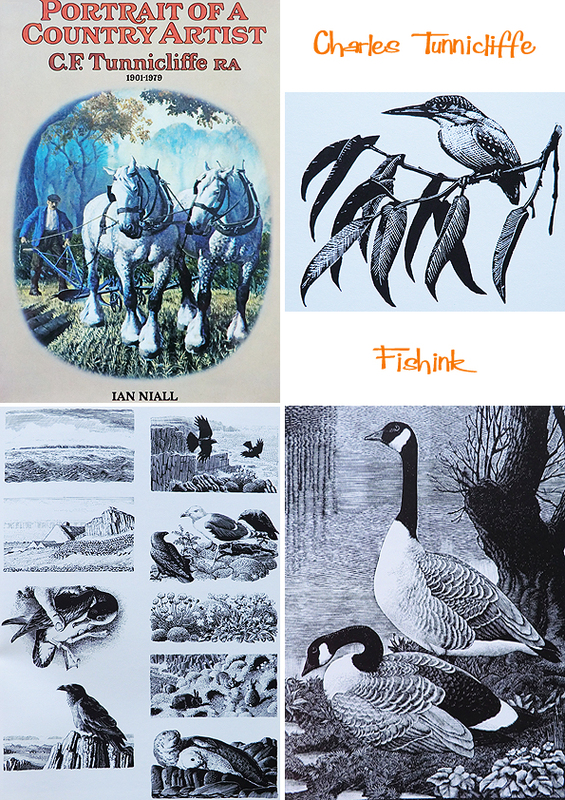 Looking through them as an adult, I remember how beautifully the painted pages were, and I quickly re-associated with these familiar scenes from nature and my youth. 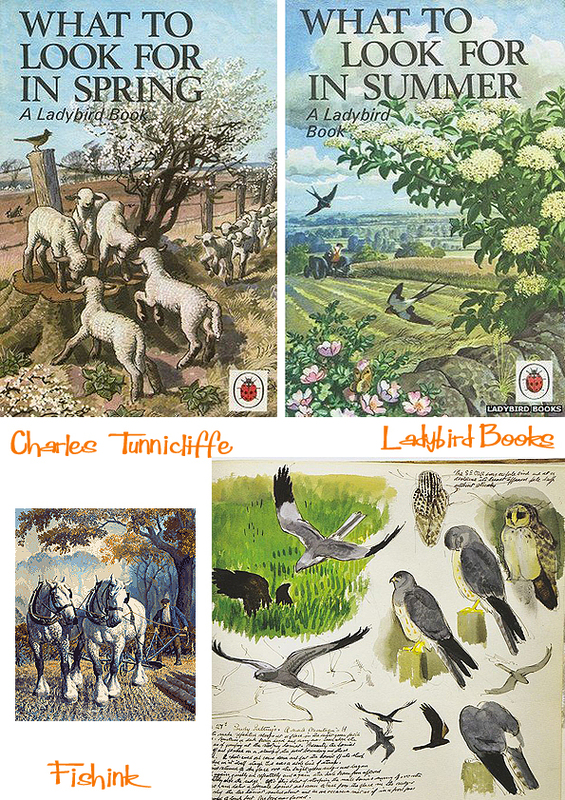 What I failed to realise, until I started putting this post together, was that the artist Charles Tunnicliffe, was a name I already had on my bookshelf. 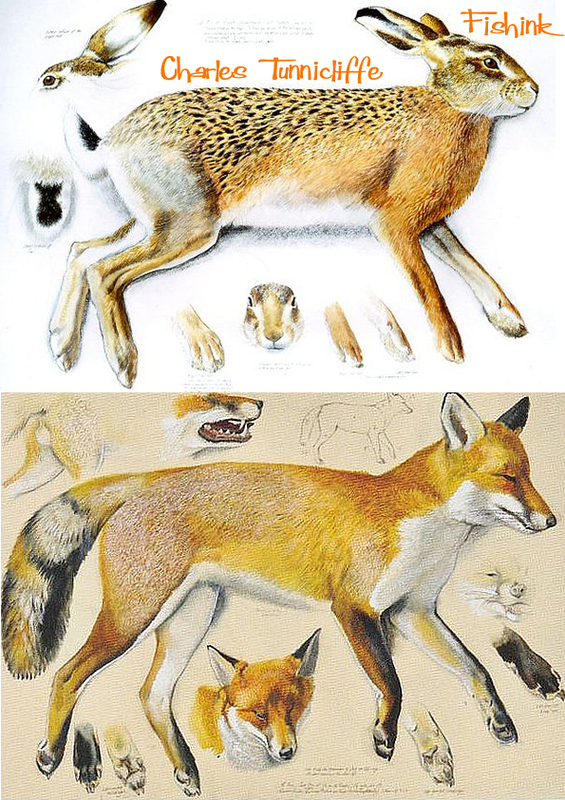 These are some of his illustrations for Ladybird books. 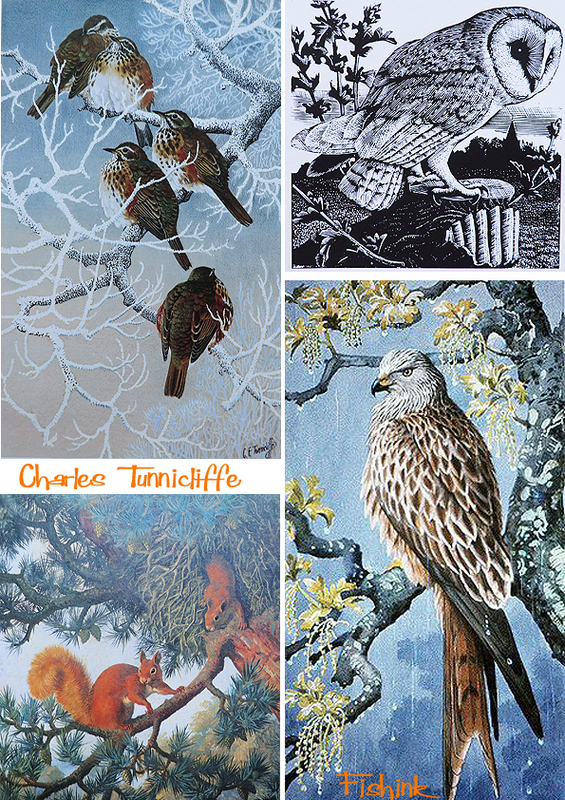 Charles Tunnicliffe was born in 1901 in Langley, Macclesfield, England. He spent his early years living on the farm at Sutton, where he saw much wildlife. In 1916 he began to study at the Macclesfield School of Art, and later went on to win a scholarship to the Royal College of Art in London. He married in 1929 at the Methodist Church, Whalley Range, Manchester, to Winifred Wonnacott, a fellow art student. In 1947 he moved from Manchester to a house called “Shorelands” at Malltraeth, on the estuary of the Afon Cefni on Anglesey, where he lived until his death in 1979. He worked in several media, including watercolor painting, etching and aquatint, wood engraving, woodcut, scraperboard (sometimes called scratchboard), and oil painting. Much of his work depicted birds in their natural settings and other naturalistic scenes. His work was also used to illustrate Brooke Bond tea cards and as a result was seen by millions of young people in the United Kingdom during the 1950’s and 1960’s. 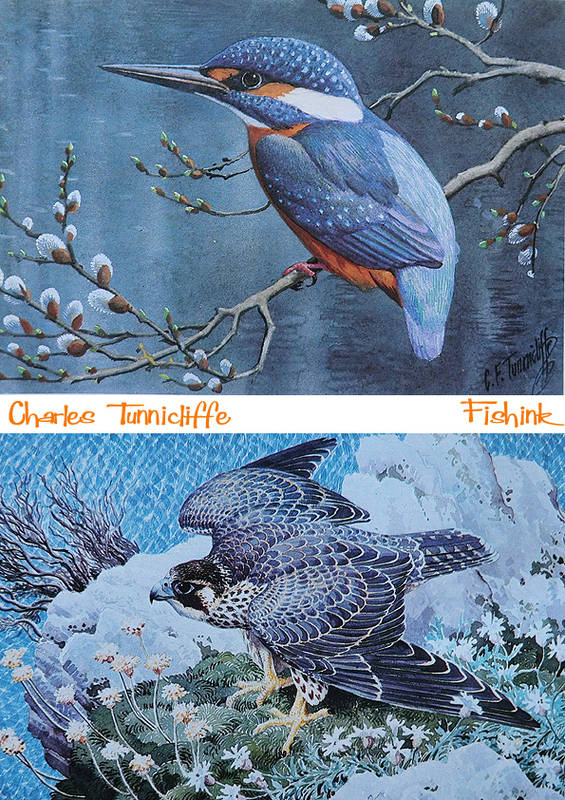 Charles’s work was characterised by its precision and accuracy, but also by the way in which he was able to portray birds as they were seen in nature rather than as stiff scientific studies. 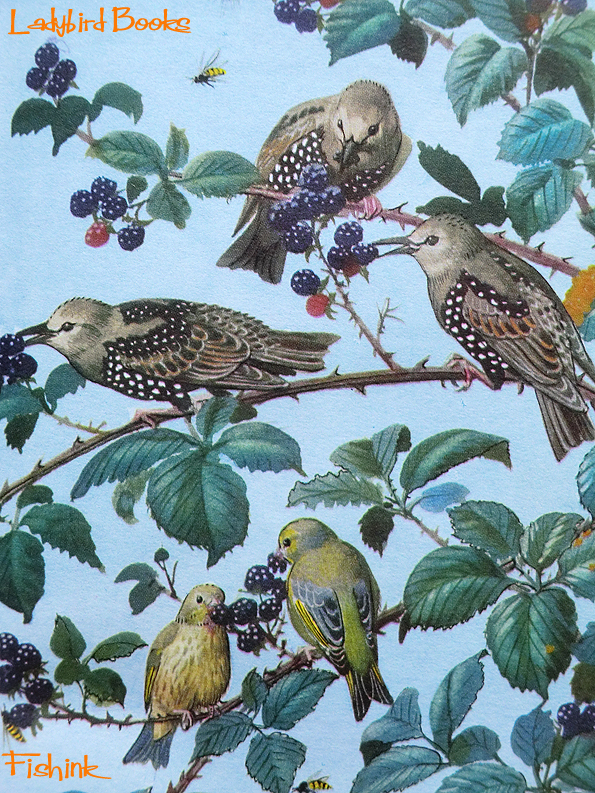 From March 1953, he painted many of the cover illustrations for the Royal Society for the Protection of Birds’s (RSPB) magazine Bird Notes, and several for the later Birds magazines. At his death, much of his personal collection of work was bequeathed to Anglesey council on the condition that it was housed together and made available for public viewing. This body of work can now be seen at Oriel Ynys Môn (The Anglesey Gallery) near Llangefni. His work shows such care and attention to detail, that you can’t help but be drawn into each scene, noticing more and more information as the eye works it’s way around the painting. 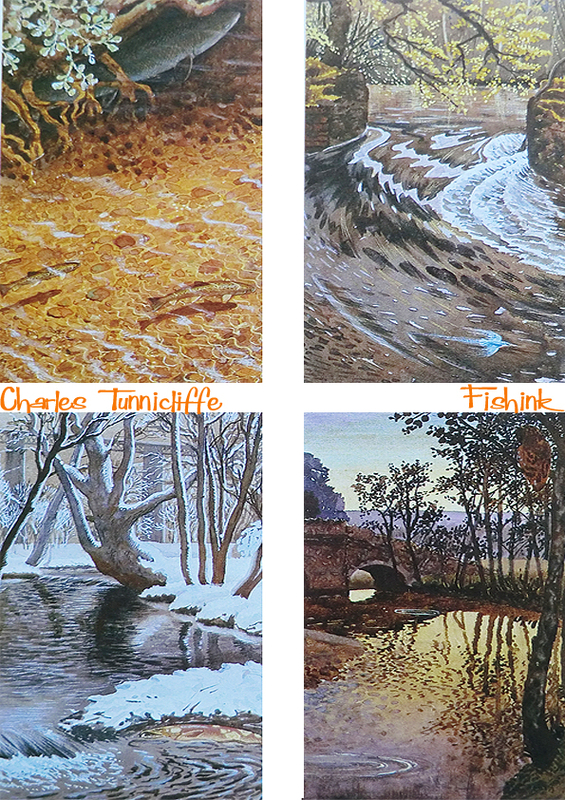 Charles also created the wood engravings too. Here’s the other two covers in the series (below) and the only other ladybird book I owned (above). And this was the book I had on my shelf already, without realising it was the same artist. Such amazing detailed and dedicated work. 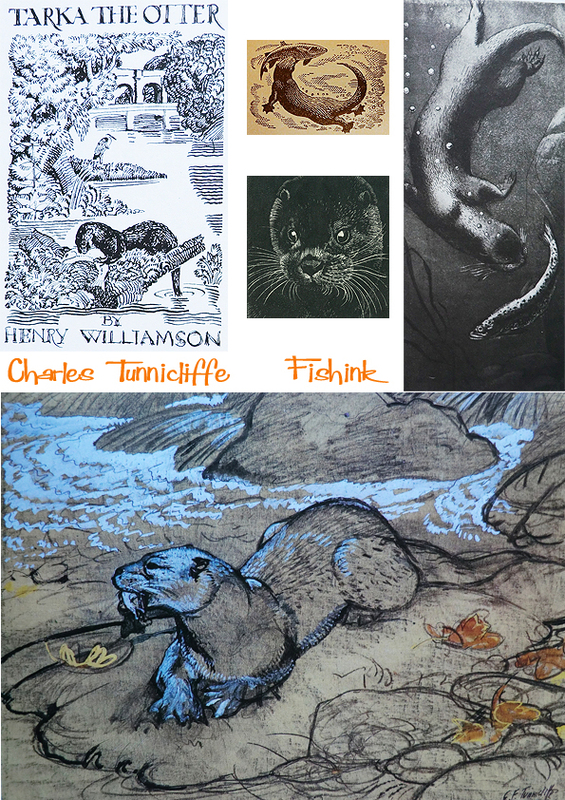 Charles also received much recognition for his work on Henry Williamson’s children’s book ‘ Tarka the Otter’ in 1932. He created many studies for Tarka, the main character. He spent days just observing and creating observational paintings, which were often life-size studies ! Can’t you just feel the frost on this branch below. 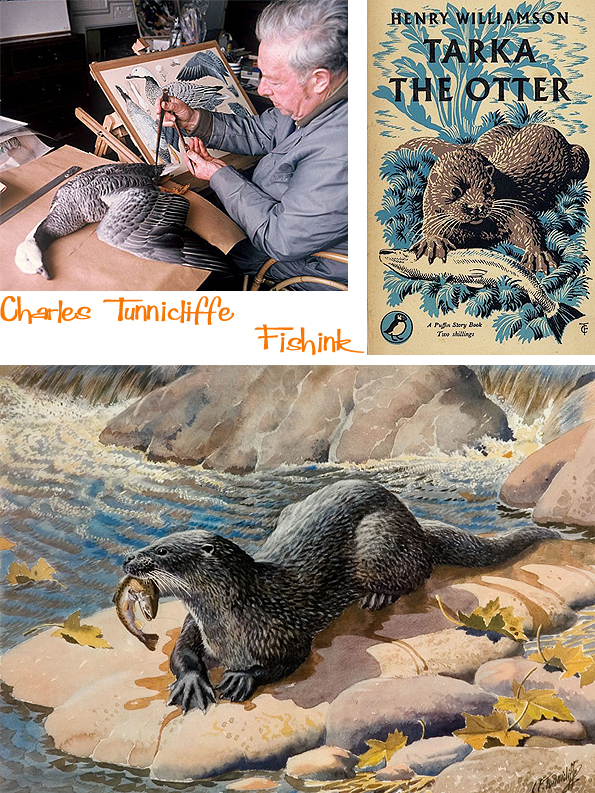 At least 250 books used Charles’s illustrations on the cover and inside. Ladybird books had their beginnings in 1915, although the company traces its origins to 1867, when Henry Wills opened a bookshop in Loughborough, Leicestershire. Within a decade he progressed to printing and publishing guidebooks and street directories. He was joined by William Hepworth in 1904, and the company traded as Wills & Hepworth. By August 1915, Wills & Hepworth had published their first children’s books, under the Ladybird imprint. 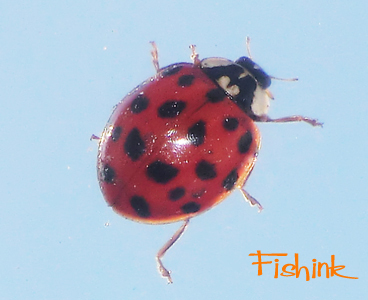 From the start, the company was identified by a ladybird logo, at first with open wings, but eventually changed to the more familiar closed-wing ladybird in the late 1950’s. The ladybird logo has since undergone several redesigns, the latest of which was launched in 2006. Wills & Hepworth began trading as Ladybird Books in 1971 as a direct result of the brand recognition that their imprint had achieved in Britain. In the 1960’s and 1970’s the company’s Key Words Reading Scheme (launched in 1964) was heavily used by British primary schools, using a reduced vocabulary to help children learn to read. This series of 36 small-format hardback books presented stereotyped models of British family life – the innocence of Peter and Jane at play, Mum the housewife, and Dad the breadwinner. Many of the illustrations in this series were by Harry Wingfield and Martin Aitchison. The 1950s to the 1970s are widely considered to be Ladybird’s ‘golden age’. This period saw the post-war baby boomers come of age, creating a mass of new consumers who were open, confident and unrestrained. Ladybird books reflected this optimism with its forward-looking design and illustrations, which depicted a utopian vision of modern Britain. An independent company for much of its life, Ladybird Books became part of the Pearson Group in 1972. However, falling demand in the late 1990s led Pearson to fully merge Ladybird into its Penguin Books subsidiary in 1998, joining other household names in British children’s books such as Puffin Books, Dorling Kindersley, and Frederick Warne. The Ladybird offices and printing factory in Loughborough closed the same year, and much of the company’s archive of historic artwork was transferred to public collections. 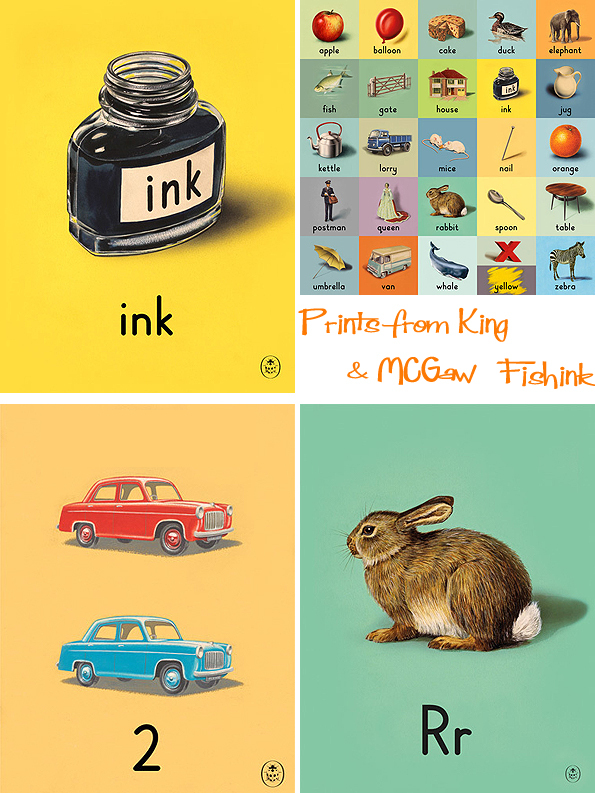 Nowadays you can pick up a lovely retro print of a Ladybird book illustration from the company King & MCGAW. 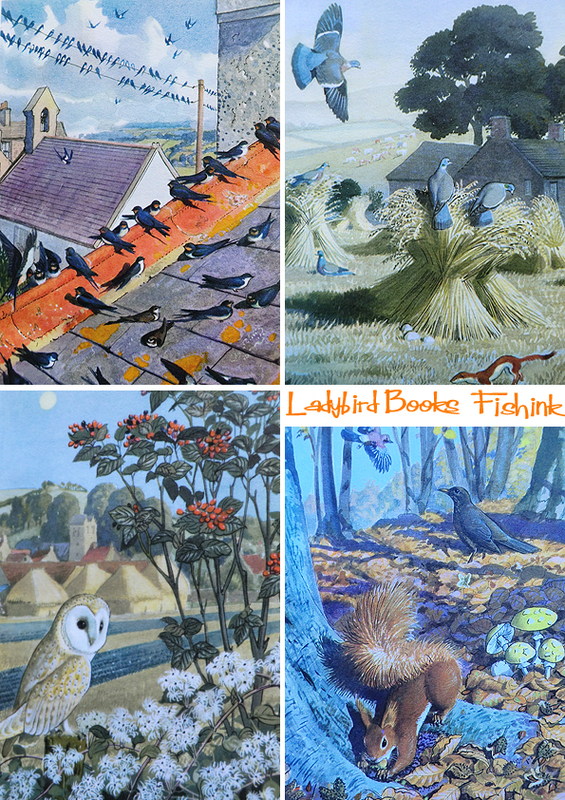 I’ve been told that over 20,000 of the images from the books have been preserved in the world’s first permanent gallery devoted to Ladybird books at Museum of English Rural Life (MERL). The gallery has scores of titles shelved chronologically from 1961’s ‘Learning to read Numbers’ to current titles such as ‘Climate Change’ by the Prince of Wales. His book is one of the new range of “expert” titles for which the first new artwork in over 40 years was commissioned. A proof sheet shows how little the books changed once a standard was established to cope with wartime shortages, a single large sheet of paper printed on both sides gave 56 pages or text, illustrations, plus a cover. 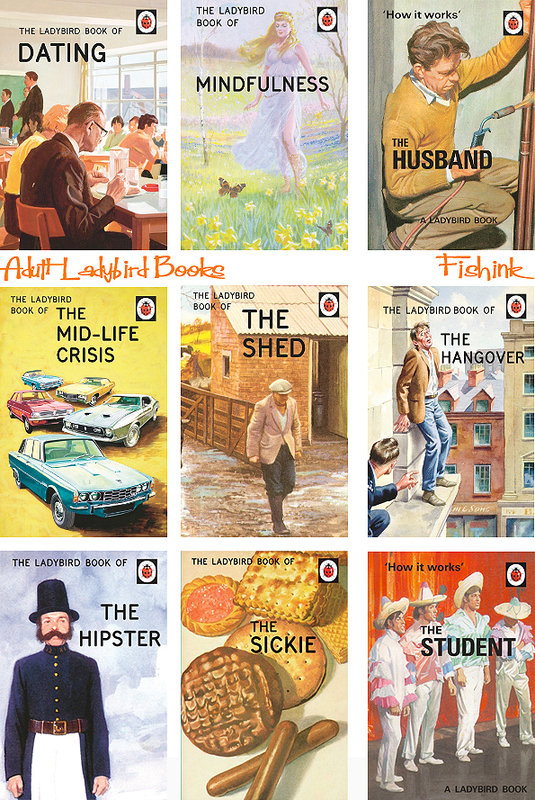 In case you have had your head in the sand for the last year and haven’t noticed, there has been a range of Ladybird books for grown-ups, which use original Ladybird illustrations with up to date, dry humoured and witty, written commentary. They have been runaway best sellers, earning an estimated £30m for Penguin. 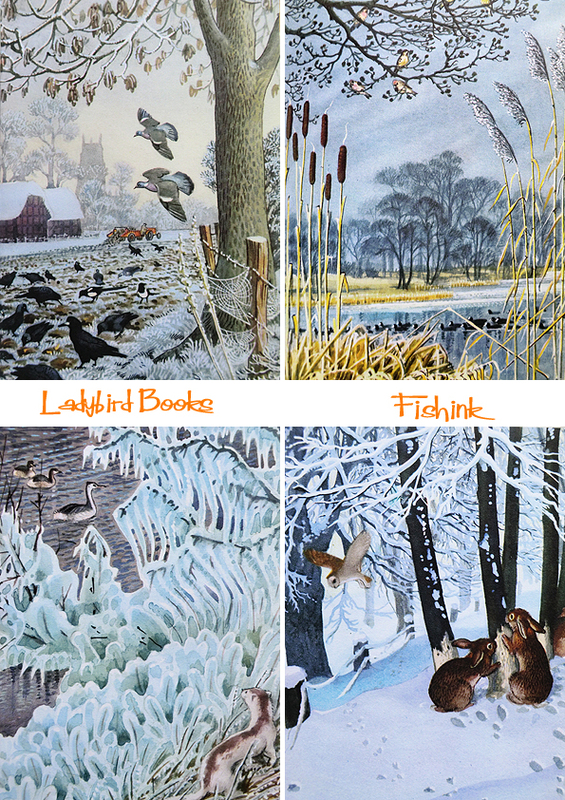 The key illustrators of Ladybird books from that vintage period were: – Martin Aitchison, Robert Ayton, John Berry, John Kenney, B.H Robinson, Charles Tunnicliffe and H Wingfield, (some images of the illustrators exist here). It is impossible to say exactly how many titles Ladybird Books has published over the past century as records before 1940 no longer exist. We do know that, between 1940 and 1980, Ladybird published a total of 63 different series, collectively containing 646 titles. By 1990, the annual Ladybird catalogue listed over 600 titles still in print, with new titles being published at an average rate of 100 per year. Today, Ladybird continues to publish around 70 new titles every year. 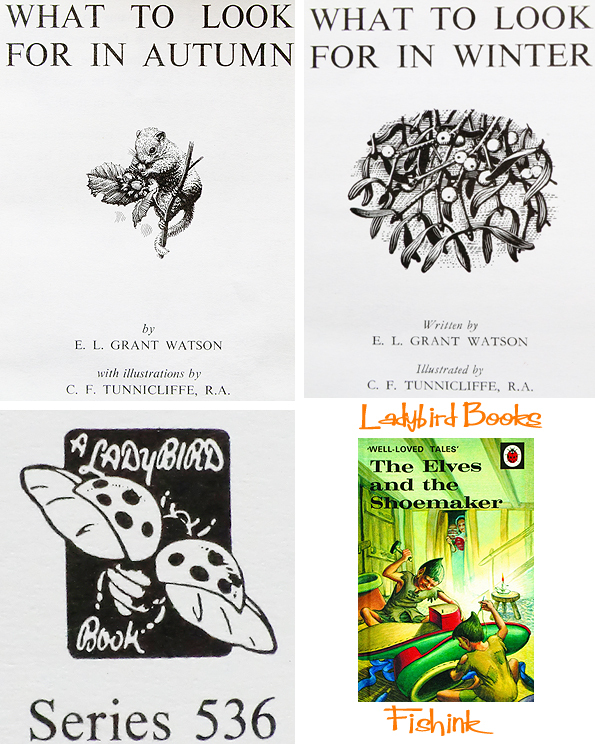 Finally, and before you start asking me what your ladybird books are worth these days lol, I happened across a site that deals in rare and unusual Ladybird publications called The Wee Web. They claim that the rarest book of them all to be ‘The Computer – How it Works’ (1971) – this is not the standard issue but rather a private publication that was especially produced for the Ministry of Defence in 1972. The M.O.D specifically asked for the book to be published in plain covers and without copyright information as not to embarrass their training staff ! Which titles do you remember and possibly still own ? Many thanks to Wikipedia, Penguin Books and The Guardian for the information in this post. 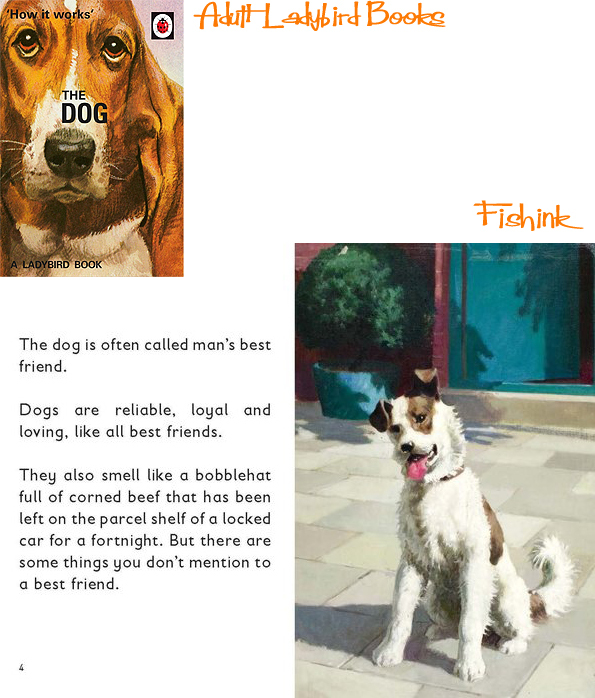 Please share this post with your friends and spread the word about Fishink Blog online, thank you for being a reader. My pleasure, there’s a great tv programme on catch up BBC about Ladybird books too. Worth checking it out. I hope he didn’t use dead models for each illustration.